At 1800 Hours the harpoon vessels Yushin Maru No. 1 and the Yushin Maru No.3 decided to run the Sea Shepherd blockade to transfer two dead whales to the flensing deck of the Nisshin Maru. 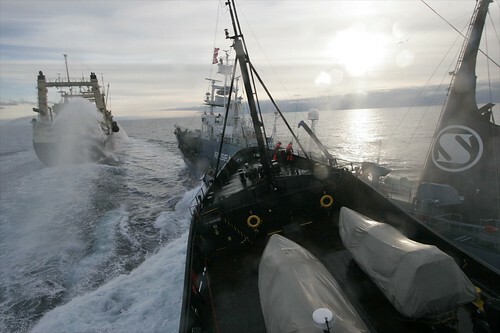 The Sea Shepherd ship Steve Irwin was blocking the slipway to prevent the transfer in order to shut down the illegal Japanese whaling operations. As the Nisshin Maru attempted to hook onto the dead whale, the Steve Irwin and the Yushin Maru No.3 collided with the forward starboard side of the Steve Irwin and the port stern side of the harpoon vessel coming together. "We told them to not continue their illegal whaling operations and that we would be blocking the stern slipway of the factory ship," said Captain Paul Watson. "They decided to test our resolve and apparently expected us to retreat when they charged in ahead of us to make the transfer." Captain Watson said that the Steve Irwin became difficult to control under a barrage of metal objects, blasts from the water cannons, and the disorientation caused by the LRAD acoustic weapons that the whalers were using on the conservationists. "I was dazed by the sonic blasts being used on us at close range." said Captain Watson. "I have to admit it was difficult to concentrate with that devise being focused on us." "I've never felt anything quite like it," said Emily Hunter from Toronto, Canada. "It penetrates the body and you can feel your muscles vibrating. It made me dizzy and left me somewhat dazed." The Steve Irwin suffered no noticeable damage from the collision and no one was seriously injured. A few of the Sea Shepherd crew were struck by golf balls and pieces of metal. The crew of the Steve Irwin were unable to determine if there was any damage done to the harpoon hunter killer boat. The two whales were transferred after the Steve Irwin shut down the operations of the fleet for twelve hours. "We are trying to make this as difficult as possible for them to continue their illegal activities, "said Molly Kendall from Adelaide, South Australia. "It is difficult to see them murdering these whales and we are determined to do everything we possibly can to stop this horrific slaughter." The Steve Irwin remains on the tail of the Nisshin Maru to attempt to obstruct any further transfers in an effort to stop the unlawful poaching of the whales by the Japanese whaling fleet. "I wish we did not have to be down here in this dangerous situation," said Captain Watson. "I've said repeatedly that if Australia or New Zealand would agree to take Japan to the international court on this than we would back off. Because international law is not being enforced, we have no choice but to do what we can with the resources available to us to defend these endangered whales in this established international whale sanctuary." Despite repeated assaults by frustrated and increasingly violent Japanese whalers, the Sea Shepherd ship Steve Irwin continues to stand guard behind the Japanese floating abattoir called the Nisshin Maru. The three Japanese harpoon boats are not in the area but the Sea Shepherd crew is prepared to obstruct them should they return. The Japanese have been accusing Sea Shepherd of trying to obstruct their props with ropes yet the whalers have been trying to do the same thing to the Sea Shepherd ship Steve Irwin. They are accusing the Sea Shepherd crew of throwing rotten butter (which the Japanese refer to as "acid") at them yet the whalers are throwing golf balls and chunks of metal at the Steve Irwin crew. In addition, the Japanese are blasting the Sea Shepherd crew with water cannons and Long Range Acoustical weapons - a sonic gun that causes disorientation, nausea and deafness. "I find it interesting that so called experts and politicians are quick to condemn Sea Shepherd's tactics for upholding conservation law yet say not a word about the escalating physical violence directed at us by the whalers who are breaking the law," said Captain Paul Watson. "Their position of siding with the poachers seems to be that if we did not put ourselves in this situation we would not be experiencing such violence. The same could be said for any policeman and Sea Shepherd is not down here to protest whaling, we are down here to obstruct illegal whaling as defined under international conservation law. We are down here to enforce the law, not to break it." There is a legal precedent for Sea Shepherd's intervention and that is the United Nation World Charter for Nature that allows for non-governmental organizations to uphold international conservation law and in Section 21(e) specifically in areas beyond national jurisdictions. The Japanese whale poachers have the advantage of superior ships, faster, more powerful ships, they have weapons and they have the support of their government that will defend whatever actions they take including the killing of our crew if that should occur. On February 6th, two incidents occurred where the Steve Irwin collided with harpoon vessels as they forced their way past the Steve Irwin's blockade in their pursuit of their poaching activities. These collisions were not intentional on the part of Sea Shepherd. "Earlier we filmed a whale being illegally killed and we watched as that whale endured an agonizing death, thrashing about in its own blood for twenty-five minutes," said Captain Watson. "We view the killing of that whale as cold blooded murder and we are committed to doing everything we can, short of inflicting injuries ourselves, to protect these defenceless, gentle, intelligent and socially complex sentient beings." The harpoon boats have not returned to the Nisshin Maru since the last incident occurred at 1800 Hours on February 6th. The Sea Shepherd Conservation Society has made it clear to the government of Australia that our interventions which are becoming increasingly more dangerous because of Japanese aggression can be avoided by Peter Garrett and Kevin Rudd simply making good on their pre-election promise to take the Japanese whalers to court. "Because Garrett and Rudd have reneged on their promises to us, the people of Australia, we have been forced to defend these whales as Australian citizens in these hostile and remote waters simply because someone has to," said Andrew Perry of Hobart, Tasmania.